When it comes to our cottage cleaners and inspectors, the Stan White Realty Housekeeping Department strives to provide an employee friendly environment in which goal-oriented individuals can thrive. The department is committed to providing competitive quality and detail-oriented service. Policies and procedures set forth in the Housekeeping Employee Handbook ensure an environment in which both our owners’ and guests’ interests, as well as our housekeepers’ interests, are best served. Cleaners and inspectors are reminded that ultimately, their “boss” is the owner, the owner’s family, or the guests for whom they are cleaning the rental home. They have a number of responsibilities for meeting the Company’s standard of cleanliness and appearance. Their job not only requires technical know-how, but people skills as well. Cleaners and inspectors are expected to always conduct themselves as if the homeowner or guest was looking over their shoulder while they work. In order to ensure a thorough clean and minimize the chance of details being overlooked, our cleaners and inspectors are provided with a White Glove Checklist and Weekly Inspection Sheet for each job, along with notes and other requirements for that specific property. Inspections follow each clean to confirm that all standards have been met before the guest is permitted to check in. Inspectors, as well as cleaners, are responsible for reporting damage, missing inventory, and general wear and tear. Filter changes, smoke alarm maintenance, high-rise light bulb replacement, hardware repairs and replacement, storm preparation, pre-season HV/AC checks, winterizations and de-winterizations, limited carpentry, minor mechanical, electrical, and plumbing issues, inventory replacement (i.e. propane, small appliances, etc. ), amenity assistance and troubleshooting (i.e. Internet connection, electronics, mechanical operations, etc.). All work that cannot be performed in-house will be subcontracted out to your preferred vendors. The maintenance department will handle the estimating, scheduling, and supervision of all work performed by third party companies. Managing rental income can be overwhelming for a homeowner, especially when it comes to real estate law compliance. Our accounting department is here to make sure funds are collected and disbursed accurately, timely, and lawfully. Every month, you will receive a financial statement via e-mail, and your revenue will be directly deposited into your account. It is important to note that having your property management company handle the billing for third party vendors alleviates a substantial burden when it comes to filing your yearly income taxes. One of the most important aspects of property management is the marketing and promotion of your home to prospective renters. In today’s rental marketing, we have found that online advertising is the most productive avenue. In partnership with Visual Data Systems, one of the leading web designing companies in the vacation industry, we’ve launched a new, state of the art website equipped with the latest features and functionality that will not only assist guests in their search but will streamline booking, payment, and communication. Examples include Live Chat, GuestWeb, rotated Featured Properties, a search results page modification (SRPM) tool, property locations on Google Maps, Shop & Compare (shopping cart tool), Share with a Friend (allows guests to e-mail one or more properties to friends and family), My Brochure (custom brochure compilation), and a mobile version of the site. While the majority of our marketing budget is concentrated online, we continue to invest annually in a full-color printed brochure that showcases the company, our rental inventory, and the area. The brochure, which we’ve been producing since 1991, is bulk mailed each year to previous renters, tourism bureau leads, and also by request. 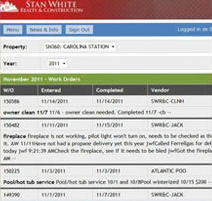 Stan White Realty also publishes ads in a number of local and national publications. Our licensed property managers are here to guide you through the many decisions involved with renting your beach home. They stay up to date on the ever-changing laws and regulations of the North Carolina Real Estate Commission (NCREC), as well as gain local and industry insight through active memberships with associations such as the Outer Banks Association of Realtors (OBAR) and the Vacation Rental Management Association (VRMA). Experienced in the area’s competitive vacation rental market, property managers make suggestions as to how you can make your home stand out from the crowd. They work with you to determine rates based on supply and demand, comparative market analysis, and, as always, your individual requirements. Your property manager will provide an annual report with your Property Management Agreement (PMA) that will address issues and provide valuable information based on guest feedback. Seven days a week, there will always be a property manager available to assist you. Each office location staffs at least one manager, and regardless of where your property is located, every manager is available to every owner. You always have the option to work with the property manager you prefer. Our managers also serve as liaisons between homeowners and their guests, as well as vendors. When conflicts arise, managers aim to resolve issues in the most compromising way possible, but first and foremost, in the best interest of the homeowner. In addition to working with our staff, owners can maintain contact via monthly e-newsletters and an online dashboard called OwnerWeb, where they track the status of reservations, work orders, accounting transactions, and other aspects of their home’s management.